Part one of this story featured on our website in July 2012. 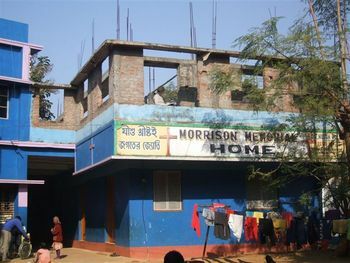 The story introduced the John Morrison Memorial Home (a children's orphanage) located in West Bengal, India and its link with the parish of St Augustine's, Cashmere, Christchurch. Here then, twelve months later, is part two. High Five! Morrison Home Family with Kiwi Guests. Along with many other folk at St Augustine’s, I was packed into the parish lounge for a very special evening. Excitement filled the air, chatter and clatter contested as people of all ages challenged the pot luck meal set before them. During the busy hum of mixed and varied conversation the food was doomed, consumed! I guess like many, I went along with a few personal questions of my own to put to the adult team but I need not have bothered. Team members spoke excitedly of their experience, stories from the heart simply flowed from each of them and my questions were soon irrelevant. As a way of introduction Rev Kevin Tapper (the team leader) had a few simple quotes that took my fancy: Namaskar - a general greeting. Bolliwood - headwear. Goolambjallum - dessert. This next quote really I like! - “winners never quit and quitters never win.” It seems there were two directives for driving in Indian traffic - blow your horn and follow traffic rules! Yes we were chuckling too, eager to hear more. It was now that Kevin introduced his Kiwi friend Joel who also calls Christchurch home. In a way Joel was part of the Morrison Home having had his first trip there in 2005. Joel had been working in Cambodia, constructing a climbing wall late 2012. With the job complete he traveled on to India to spend Christmas with the Kids at the Morrison Home. Joel, who speaks a little pigeon Bengali, was at the Home as the Cashmere Team arrived. This was a huge help to the arriving Kiwis as only a little conversational English is spoken at the home. Perhaps now is a good time to introduce the remainder of the Team. Team leader, Rev Kev as he is affectionately known had with him his loving wife Helen, a teacher, their daughter Megan, at that time a student of Laidlaw College, Christchurch; Mrs Gillian van Voorthuizen a busy housewife and teacher; Mrs Kaye Hyams, health professional and Mr Alistair Phillips, an arborist and keen photographer. Gillian the teacher with friends. It was now members were invited to speak briefly on two topics; what were exciting things and what were challenging things? Initial greeting with our hosts at 10pm. Helen noted that a New Zealand city has set boundaries and lots of green. “In India one is unsure when one leaves the city. The Home is on the outskirts, we walked to Chandrakona Road. We noted many brassicas are grown, cabbage and broccoli. Family plots are split to sons and split again as generations come, boundaries are blurred. The fine rich soil is very red and heavily cropped often three crops per year. There are no clear demarcation lines, city, town, village, hamlets all within blurred boundaries. Motorways can be four lanes each way with heavy traffic roaring by. There are roadside stalls all the way, even along the centre of the motorway and little hamlets to the left and to the right with rice spread drying in the sun. The green crops were covered with red dust. The green of rural New Zealand was impossible to find. All this coupled with people everywhere was a real challenge. Kevin observed that the Church and the Home are closely linked, that Nathan is both CEO and Pastor of the Church. The Church runs a mother’s clinic. Many women streamed into the Home when Helen gave her testimony, she kept her words simple and used short phrases. These were translated; the demeanor of the women was noticeable, with many making eye contact and nodding as she spoke. On one occasion the Kiwi visitors attended a children’s meeting with two hundred 5 - 15 year old children from the village present. The discussions included bible stories plus health and safety issues. Father Abraham was a favourite song. A relay for one hundred and twenty kids required major organizational skills. 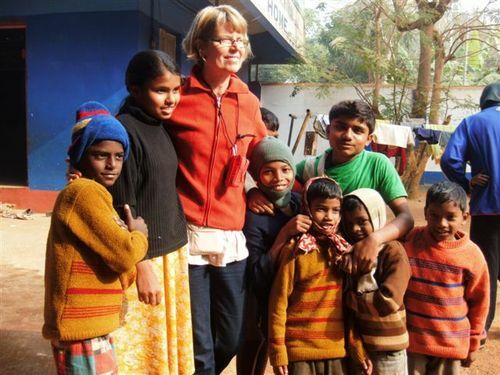 On one particular day each of these children were weighed and given a blanket - an outreach from the Home to the village, financed from supporters in the USA. Refreshment stop enroute to the beach. Excitement levels rose, the kids were hearing whispers of a visit to the gardens and the chance to ride the bumper boats. Of course we had to pay to enter the gardens. As Kiwis, our eyes scanned the gardens, immediately certain thoughts came to mind - gosh, OSH would have a field day here! Isn’t it interesting how we judge from what we know, from what is normal for us? The children however had a ball, rickety old paddle boats on dirty brown water were a source of utter joy to them. They knew no difference. The AAW at St Augustine’s had sent a significant financial gift via the travelers from down under, especially for the children at the Morrison Home. One New Zealand dollar goes a long way in India - NZ$1 = 40 Rupees. Indeed it did go a long way, as the blurry eyed Kiwis observed! “Chandrakona Road is a long five hour car journey to the Bay of Bengal. It was a 6am departure for the five fully ladened hired vehicles on a winters morn. On arrival we found the beach was crowded, people simply stared at us. It was all there; horse rides, animal dung, drinks, coconut milk, jewelry, human dung, overt massage, professional beggars, varying quality of clothing etc. “The children, wearing their clothes, loved the beach. Photos snapped as they splashed about reveal expressions of pure and utter joy all over their faces - thanks AAW Ladies! Shopping was quite an experience; sometimes scary but always very colourful. Sabita was with us which was very helpful, especially with the language barrier. We walked to a country area followed by the children, intent on visiting a village well. By chance we met two of the original boys from the Home. Adults now, they have gone on to start their own homes in Kolkata - John Morrison’s legacy continues on. Churches in India are ‘Community Churches’. Cordial is used for communion, not wine. Preaching there was challenging - we all used short sentences while Nathan translated. There’s is a simple faith which includes preaching the Word and a pure love for God. The atmosphere outside the Home is so oppressive - constant noise - horns blowing, heavy base music, clashing; thud - thud - thud. Christian worship is such a contrast - daily time with God is very special. The ten day visit to the Morrison Home was soon over. On a Tuesday the Team headed for home minus one. Alistair headed into the sunrise and the unknown. He took the opportunity to trek through the mountains of India and Nepal with his camera at the ready. He is on extended leave for a few months. Of course parishioners are itching for his return and another photographic evening, the first fundraiser for the next mission trip to John Morrison Memorial Home perhaps? A special thank you to individual team members for allowing their comments to be recorded here!